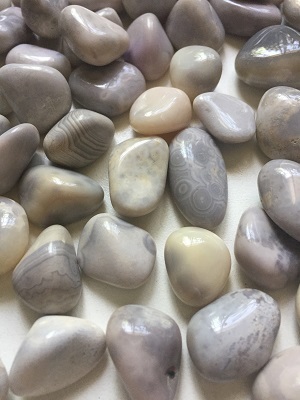 Crazy Orb Agate tumbled stones from Brazil with patterning of circular designs. 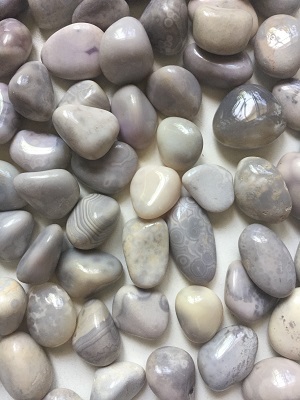 Crazy Orb Agate tumbled stones from Brazil with patterning ranging from small dots to circular orb designs. 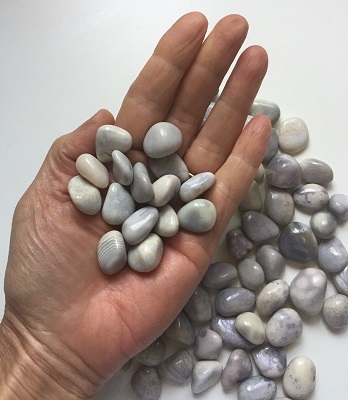 The soft grey color and patterning of the Crazy Orb Agate resonates with its soft, cooling and calming energies, bringing peace of mind. Crazy Orb Agate reminds one of the cyclical nature and flow of life. Crazy Orb Agate is gentle and nurturing and helps one remain patient and fluid when coping with changes. 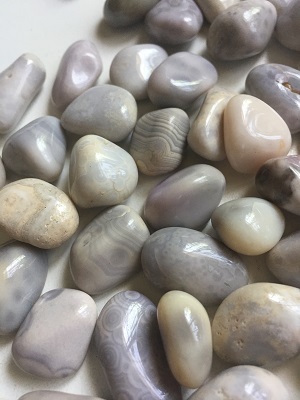 Crazy Orb Agate may be helpful for those who suffer from depression gently bringing focus to the positive and joyful aspects of life. Crazy Orb Agate helps one to see and appreciate the many blessings in life. Crazy Orb Agate may be helpful during low physical bio-rhythmic days bringing energies into balance and steady state. Crazy Orb Agate allows one to laugh and supports a playful attitude in life. Crazy Orb Agate maybe helpful for increasing stamina and energetic physical levels. In healing, Crazy Orb Agate may be helpful in the treatment of the heart and supports healthy vital organ functions.